I’ve zoomed right on by this road for years, but of late I’ve taken to exploring side roads. 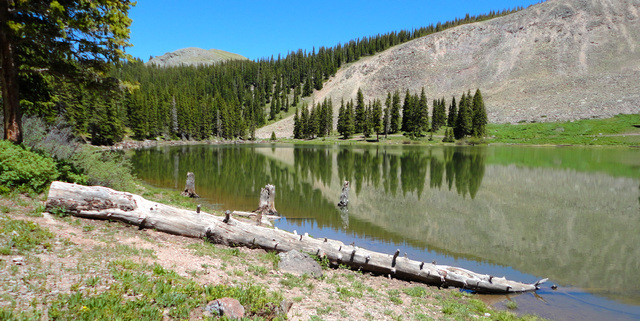 The three Alta Lakes, two of which are publicly accessible, are off of Colorado State Hwy 145, not far south of Telluride. The photo below shows the sign you’ll see from Hwy 145 as you travel south from Telluride. (A GPS track is at the bottom of this post.) I traveled this road on 1 July 2011, several weeks ago. Sign for Alta Lakes turnoff. Not what I'd call impressive. What led me to look at it was a nearby sign that promised access to the National Forest. After traveling up the well-maintained road (any vehicle) for aways, you come to a sign that offers two possibilities. I check out both. Left takes you to Alta Lakes. Right heads for Gold King Basin. I opted to check out Gold King Basin first. 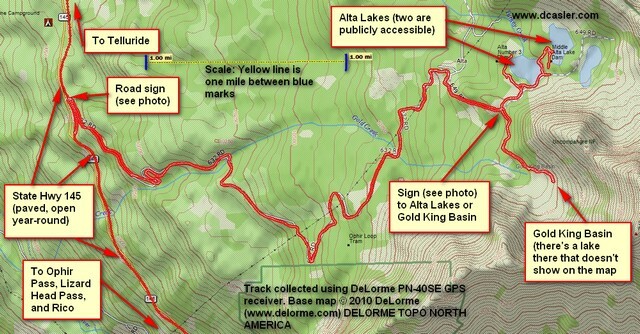 If you look at the GPS track where Gold King Basin is, you’ll see that the high mountains encircle it on three sides. The basins were carved by glaciers many eons ago. Very often there’s a small lake at the bottom of the basin’s rockfall, and although it’s not shown on the DeLorme base map, indeed there is a lake. I took two pictures, one looking up at the mountains towering over the basin, and the other looking to the northwest, both taken near the end of the road as shown on the map below. Lake in Gold King Basin. You have to look closely because everything is so green this year it all blends together. Interestingly, there’s a home built right on the lake, a very space-age-looking thing, but it’s hidden by the trees in the photo below. After a few photos to enjoy the incredible high-country sights, sounds, and smells, I headed back down and then up to Alta Lakes. There are campsites available and several were taken the day I visited (1 July 2011). I’m glad I checked out this sideroad. The GPS map is shown below. The GPS (WGS-84) coordinates for the turnoff are approximately N37° 53.1′ by W107° 53.3. GPS track showing road up to Alta Lakes and Gold King Basin. 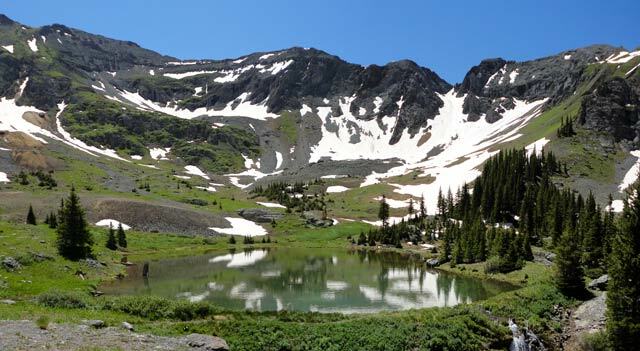 This entry was posted in Motorcycling, San Miguel County and tagged alta lakes, gold king basin. Bookmark the permalink. I haven’t been up there in a few years, but I think the answer is yes. Are you able to access this without a 4×4? Hi Brian. It’s been awhile since I’ve been up there, so I can’t speak for the state of the roads. Many of the Forest Service areas where camping is permitted are first come, first serve. Generally they are primitive campsites—no water, no showers, no toilets, no nothing. I suggest you contact the Forest Service regarding the site. They’re in the Uncompahgre National Forest. See this Forest Service site for more details and contact information. How far is Alta Lakes campground from the fork with Golden Basin? With a low car, would you recommend parking at the end of the paved road and backpacking in? Also, do you need permit to access campground? Dan, I haven’t been there in awhile, but do not remember the road as being difficult. I don’t recall having any trouble, so unless things have changed, I suspect you’ll get there in your Jeep without any unusual problems. Hi, How would you describe the difficulty of driving the Alta Lakes Road to its end (at the two ponds at ~11,323’) and to Gold King Basin? How does it compare to other 4wd roads in the San Juans? Thank you.